Here you will find further information on Little Bites Rescue, use the links below to jump to each section. If you have any questions, please don't hesitate to contact Peggy or Nigel as they are happy to help! What is Little Bites Rescue? Where do all these degus come from? How do I go about adopting degus from Little Bites? Little Bites is a small animal rescue centre based in Luton, UK. It is run by Peggy and Nigel, two amazingly dedicated people, from their home in central Luton. 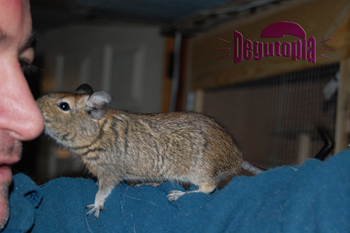 The majority of animals they take in are degus, but they occasionally take in other animals too, and in their home you will see there is all sorts, from degus to hamsters, African land snails to snakes, budgies to cats, and even a gorgeous bearded dragon. Not all the animals in their home are available for adoption, those lucky enough have found their forever home with Peggy and Nigel, where they are part of their family. Their love of animals and desire to help those in need (humans and pets alike) has driven them to open up their home as a sanctuary for degus. Their home became a dedicated rescue centre in around 2012, when they experienced a sudden explosion of interest from people needing to rehome their degus, and finding they had nowhere to go. Reluctant to turn away anyone in need, Little Bites takes in as many degus as they are able to, and it is quite remarkable to see the amazing ways they are able to accommodate the degus into their home until they find their new owners. 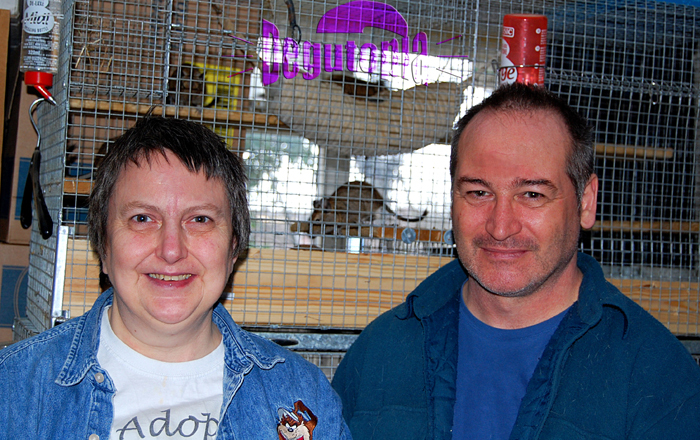 Peggy and Nigel have so far funded Little Bites themselves, using money from their own pockets to feed the degus in their care, pay for veterinary care and neutering, building and adapting cages, and using their own time to find new homes for their animals waiting. They appreciate any help on offer, and if you would like to help them out, please visit the Little Bites Donations page to see what they would find useful that you could give them. 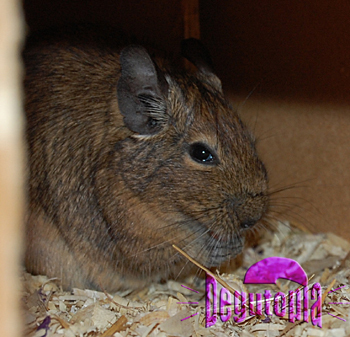 Their dream is to have a dedicated degu adoption sanctuary that is large enough to cope with demand, and to become more widely known in order to help educate people about degu care, offer advice and support, just like Degutopia. Ultimately, they would like to set up independent Little Bites Rescue centres around the UK, as part of a rehoming network, so that degus everywhere aren't left out. The degus that come to Little Bites do so for a huge variety of different reasons. Some arrive as there has been a family tragedy or illness that means their owners can't cope or afford to look after their animals. Other degus arrive as a result of mis-sexing by pet shop staff, causing an unexpected pregnancy and pups that have nowhere to go. In some cases, owners move to a new house and aren't allowed by landlords to take their degus with them, or they no longer have the space for them. In some rare cases, degus have been picked up wandering around in parks or car lots after being 'turned loose' and abandoned by their owners. Pet degus aren't adapted to survive in the British climate, and would almost certainly have died if they hadn't been spotted. Whatever the reason behind it, you can be sure that life gets a lot better for every degu that comes into Peggy and Nigel's care. Every new degu that comes in is assessed, given a health check, and if necessary given the veterinary treatment they need to recover, before they are allowed to go on to a new home. This can be as simple as neutering to allow a male degu to live with the female he arrived with safely, or a course of antibiotics to get them back on their feet. If a single degu comes in, Peggy and Nigel carefully take the time to introduce them to suitable companions before they are homed, which greatly increases their quality of life. If a degu arrives that is too sick or elderly to be safely rehomed, they get to stay permanently at Little Bites and given extra special TLC. The huge variety of backgrounds and histories for each degu at little bites means there is also a big variation in personality and behaviour in each and every degu, just as there would be with a degu purchased from a pet shop. Some degus at the rescue have been passed around from home to home before they get to Little Bites, meaning we may never know their true history, or how they have been mistreated. For this reason, Peggy and Nigel take great care to match up the degus with their new owners, based on how they get along when they are first introduced. There is a degu (or two) at Little Bites for everyone! Because there are so many degus available to choose from, your first step is to contact Peggy or Nigel, who can arrange a time for you and your family to come and meet the degus at Little Bites in Luton. When you arrive, you may feel a little overwhelmed at the choice, but as you get to meet each degu group, you will see how each group may respond differently. It is true that degus choose their owners as much as you would like to think otherwise! There is no pressure and you can go home to think about it first should you be unable to choose on the day. Peggy and Nigel would much rather you take your time than rush into it, so they and you can be sure your degus are right to go to their forever home with your family. The number of degus you choose to adopt should be based on the size of enclosure or cage you have prepared for them at home. 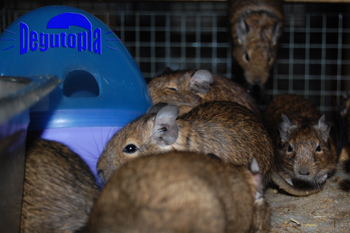 You can check how many degus your cage is suitable for using Degutopia's cage space calculator. 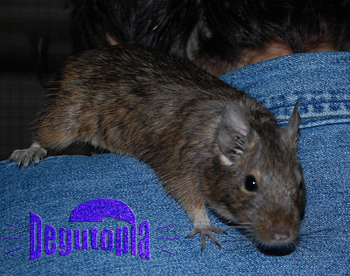 Little Bites allows a minimum adoption of two degus, because degus can become unhappy if housed alone. There is no maximum limit, depending on the group sizes available, and your enclosure size. You need to provide your own cage for your new degus, as Little Bites needs all the cages they can to make space for new arrivals. While you're at Little Bites, Peggy and Nigel will be happy to talk you through any questions you might have about adopting degus, degu care, and aftercare. They are more than happy for you to stay in touch after taking your degus home, and are on hand to help with anything that might arise. When you're ready to take your degus home, bring with you a suitable travel cage to transport them- further details can be found on the traveling with degus section of Degutopia. In the unlikely event that you don't get on with your degus, Peggy and Nigel will accept them back without hesitation. They want you all to be a happy family together! Little Bites does not ask for an adoption or rehoming fee. 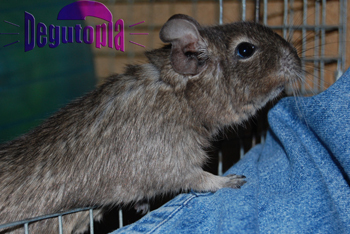 Voluntary donations are welcomed, but they would much rather receive donations of degu food, bedding, and toys for the other rescue degus than money. Discuss with them before you visit what kind of donations they would like, or you can visit the Little Bites Donations page. 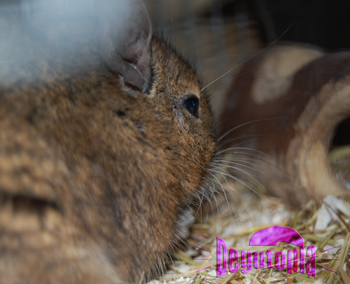 By far the best way for you to help this degu sanctuary is to adopt some degus from them. The more degus that can find a loving new home, the more degus in need they can help. 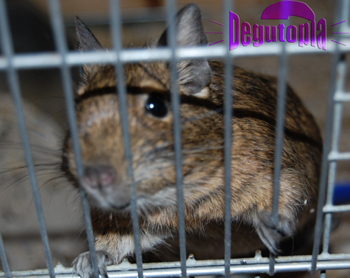 Having so many degus waiting for homes, space is limited, and cages are in short supply! Please think about adopting some degus today. If you aren't able to adopt at the moment, then the next best way to help is to donate something that Little Bites needs. Although money donations are always welcome, often donations of food, toys, bedding, treats and wheels are much more appreciated! If you have an old or spare cage that is suitable for degus, this type of donation is especially welcomed. For more details about donating, visit the Little Bites Donations page.